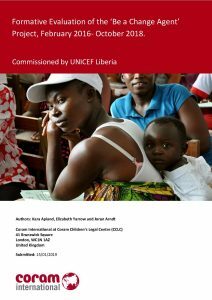 In 2018, Coram International conducted a formative evaluation of UNICEF’s ‘Be a Change Agent’ Project (B-CAP) in Liberia. BCAP, which operates in two of Liberia’s most deprived urban slums, aims to empower vulnerable adolescents through youth entrepreneurship, formal and non-formal educational support and livelihood skills training. The primary purpose of the formative evaluation was to generate evidence to inform and improve B-CAP’s implementation in its second phase. The evaluation assesses the relevance, effectiveness, efficiency, and sustainability and scalability of B-CAP and provides recommendations. The evaluation sought to determine the extent to which B-CAP has achieved its planned (and any unintended) results, to identify factors that affected its implementation, and to develop recommendations which can strengthen the project going forward. UNICEF has rated this evaluation ‘Highly Satisfactory’ and considers it to exceed UNICEF and UNEG standards for evaluation reports. UNCIEF also concludes that decision makers may use the evaluation with a high degree of confidence.